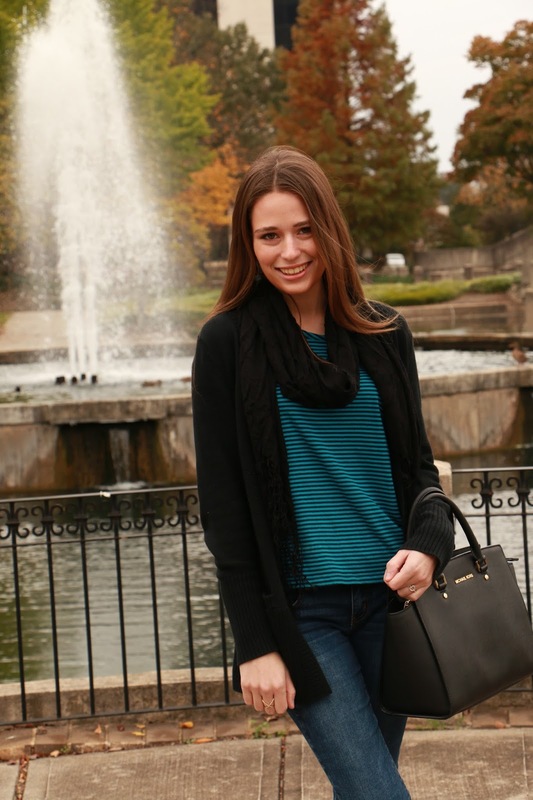 Here is one of my favorite casual outfits that I wore last week in Pennsylvania! It took me a long time to hop on the blanket scarf train, but I'm so happy that I finally did. 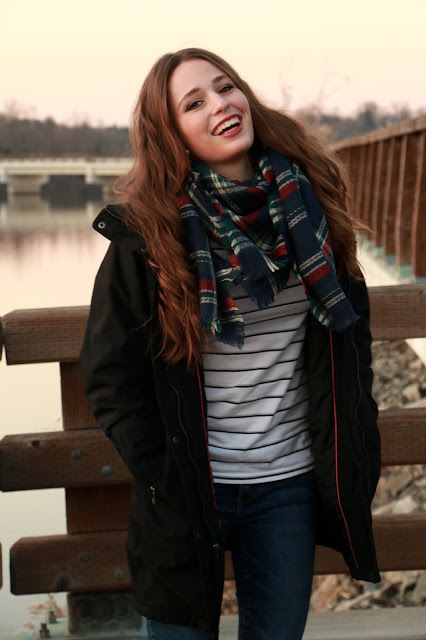 For the longest time I really didn't understand the hype over blanket scarves, they just seemed so "basic" to me and I didn't really want to wear a scarf that everyone and their mother already had! But then I actually purchased one on a whim and tried it on... and I instantly fell in love. They're so warm and comfy, and I understood immediately why they're back on trend for this year's winter season! I really enjoy wearing my blanket scarf as a cozy shawl as well. 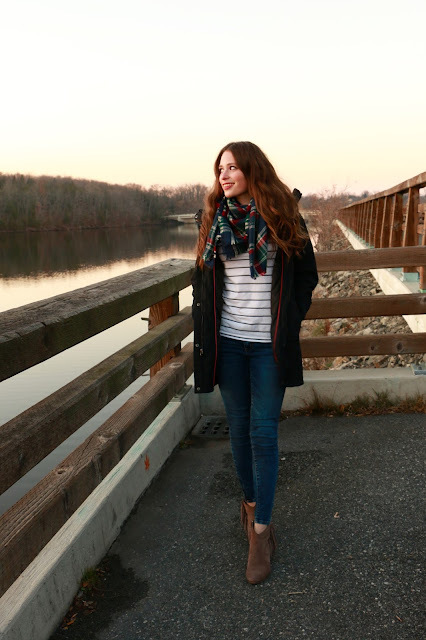 I wore this casual outfit for a day of driving and sightseeing in Pennsylvania's Amish country with my best friend and her family and friends! It was the perfect balance of warm and comfortable but still cute! I love the look of a plaid scarf worn over a striped top- so classic. 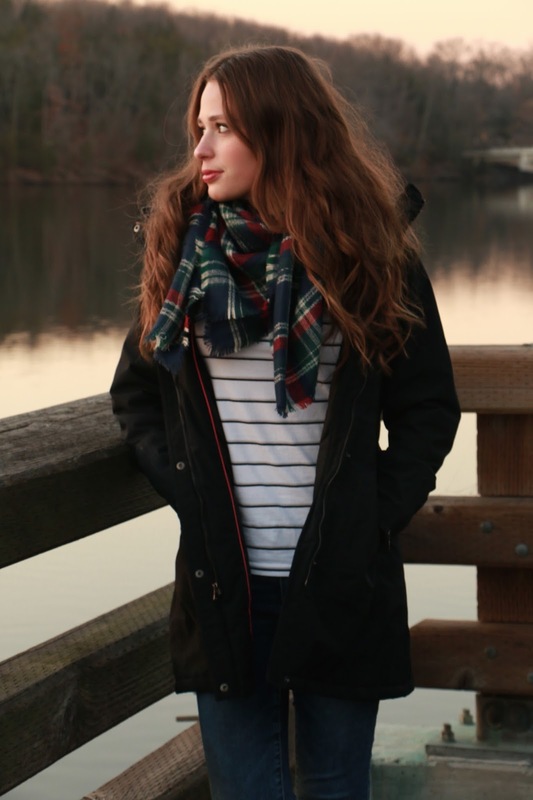 Are you on board with the blanket scarf trend? And did all of you have a nice Thanksgiving and Black Friday? I can't wait to share more soon about my trip to PA! 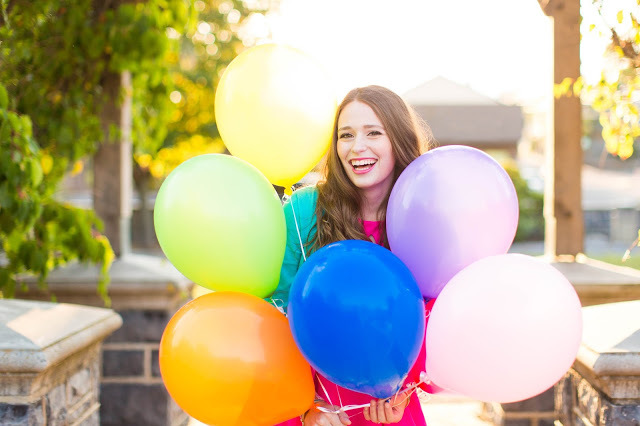 Cue the balloons and confetti! It's finally Black Friday- the best day of the year for all retail therapy fanatics! This is my ninth straight year of Black Friday shopping, and I couldn't be more excited. Every year brings more fun and better deals than the year before! *Macy's - Online take 20% off with code THANKS and free shipping over $50, Nov. 25-28. Hundreds of in-store items on sale on Black Friday! *J. Crew - In-store and online take 30% off all items never on sale, and 40% off sale merchandise. Use code HOLIDAY online. Nov. 26. *Anthropologie - In-store and online take 25% off all items with code SHOPTOIT. Nov. 26 online, Nov. 27 in-stores and online. *Charming Charlie - Free shipping online, $10 doorbusters in-stores and online. Nov. 26-27. *Nordstrom - 25% extra off all sale items in-stores and online. Nov. 26-30. *Express - 50% off everything in-stores and online. Free shipping online. Nov. 26-27. *Lilly Pulitzer - Free gifts with purchases in-stores and online. Nov. 26-30. Please let me know what your best Black Friday finds this year were!! Best of luck to all of you fellow shoppers! And I hope that all of you are having a happy and restful Thanksgiving! I am spending some time today reflecting on all of the blessings, growth, and change that has come into my life in the past year. God is forever faithful!! 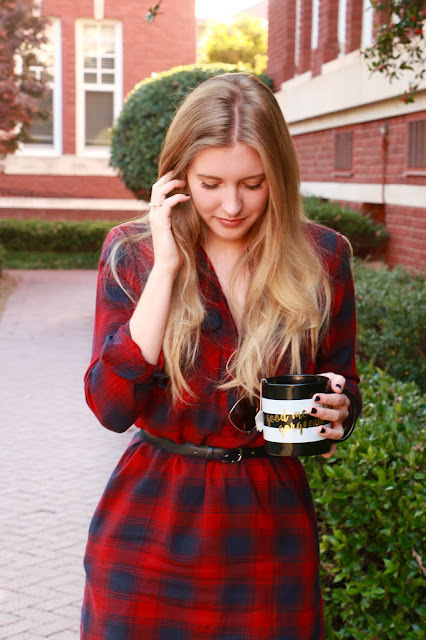 Earlier this summer, I saw this adorable top from The Red Dress Boutique come across my Instagram feed. I instantly knew that I had to have it! Not only was it on sale at the time (I'm pretty sure that I got it for under $15, including shipping! ), but it's also the comfiest top ever. 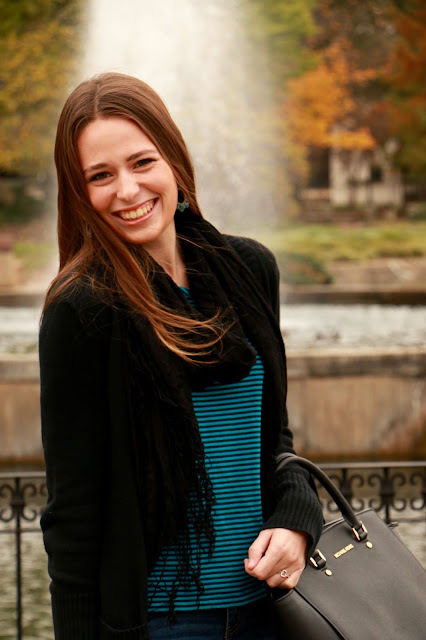 And what blogger doesn't love to advertise her job / favorite hobby a little more than normal?! 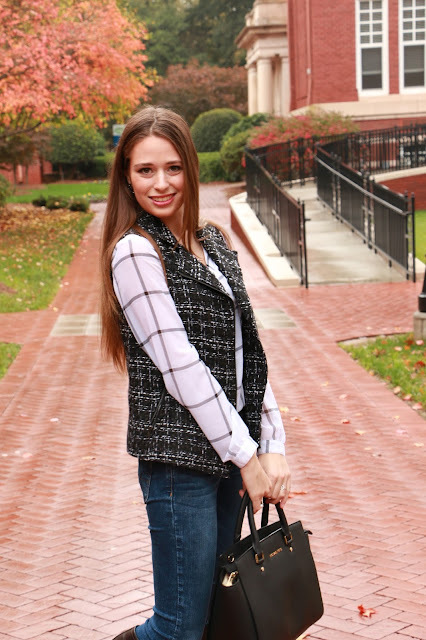 ;-) This fun graphic top is perfect to pair with jeans and booties for a casual look, or you can take a dressier take on it like I did with this outfit! Speaking of blogging "attire," now is the perfect time to start shopping for holiday gifts for your blogger besties, or any friends in your life who share your passion for blogging! Be sure to check out the Ultimate Blogger Gift Guide post that I wrote this summer- most of the items are still available! There will be no Midweek Ramblings + Recent Purchases post for tomorrow/this week... taking this week off since it's Thanksgiving and I will be traveling! Stay tuned for more posts later in the week though, and please follow me on Instagram and Snapchat @miss_alk to stay up to date on my fun travel plans for this week!! 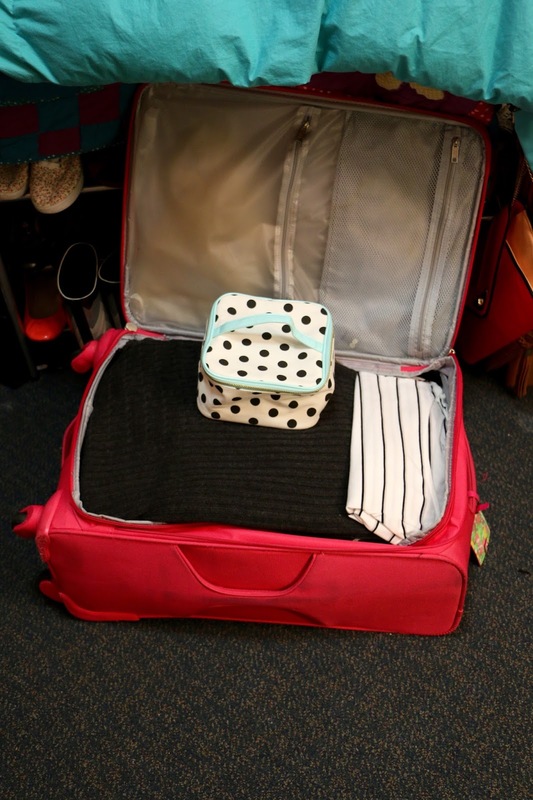 Tips to pack for Holiday Travels. I am so excited to be leaving tomorrow afternoon for five days of fun-filled Thanksgiving break plans with my best friend! I absolutely love to travel, and I will be spending this year's Thanksgiving in a state that I have driven through several times on my trips to and from Maine to North Carolina, but have never actually stopped to enjoy. I can't wait! Since I am a senior in college, this marks my fourth year of packing for holiday break travels such as Thanksgiving or Christmas break. I have spent all of my past holiday breaks visiting everywhere from my home to friends' houses to traveling abroad! I thought that I would walk y'all through in today's post how I am preparing for this year's travels, and also some general travel tips and guidelines that I always use when packing. One of the first things that I always start by packing is my pajamas! I can be very picky about pajamas, and I'm not ashamed to admit it. ;-) I sleep almost exclusively in long-sleeved shirts, unless I'm ever sleeping in a room that is extremely hot (aka my whole month studying abroad in France!) My favorite pajamas are ones that are old and ratty and worn-down, because that makes them extra comfy!! When I am traveling though, I try and pull out my semi-cute pajamas, so I don't scar the eyes of my travel companions (if I had it my way, I would wear my favorite baggy sweatpants every night!). For travels longer than a couple of nights, I like to bring different pajama options, since I never know what the temperature of the room that I'm staying in will be like, or how many blankets I'll have. 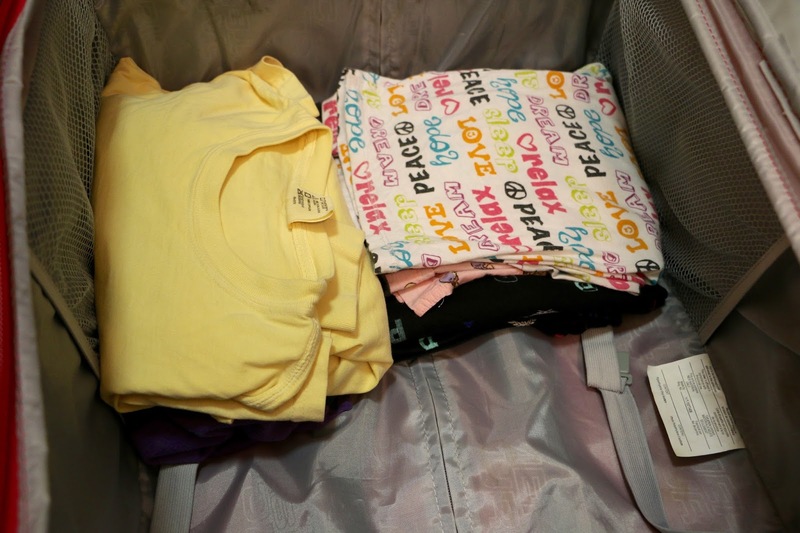 For this trip, I am packing a pair of warm flannel pajama pants, cotton pajama pants, one pair of pajama shorts, and some of my favorite long-sleeved sleep shirts! Next, I pack my shoes. Shoes (and especially boots) can take up a lot of space and weight in a suitcase, so before adding a pair in, I always think to myself How many outfits can I form around this pair of shoes? Am I already envisioning the perfect outfit to wear on my trip while wearing these shoes? Will these be beneficial to the weather of where I am traveling? 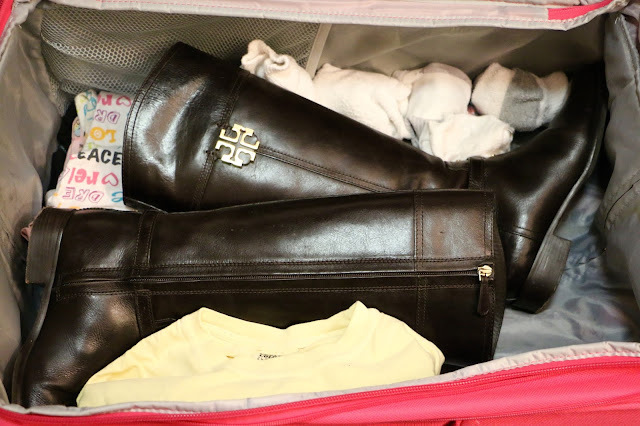 Obviously my favorite Tory Burch riding boots are a must-pack for Thanksgiving break travels, as this holiday falls right in the middle of riding boot season! Next comes the funnest part- outfit planning! When packing for my travels, I usually bring a couple of "statement pieces"- things that I will only wear once, maybe for a blog shoot, maybe for a special dinner or event, etc. Then the majority of the clothing that I pack are closet essentials that I can layer or mix-and-match! Since I never have my whole wardrobe with me on a trip, I try and pack strategically, and think how many outfits I can get out of the fewest pieces. Something that I enjoy about packing for Thanksgiving or Christmas break trips is that this is often the first time that I really go through my favorite cooler weather outfits from the year before! Packing is a great time to clean out my closet a little bit, and to see which outfit pieces I still love and want in my wardrobe, and also to see what doesn't fit anymore or isn't my taste now! 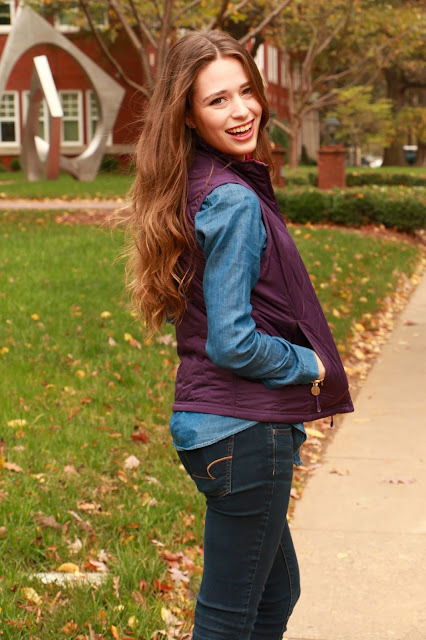 I am really excited to be bringing my favorite fur vest on my Thanksgiving break trip and I already have a couple of outfits planned around it- here is a very similar vest to mine! Once all of my clothing is packed, it's time to start on things like jewelry, accessories and make-up! My make-up is usually one of the last things that I pack, since I wear my make-up favorites right up until the day that I leave for traveling. 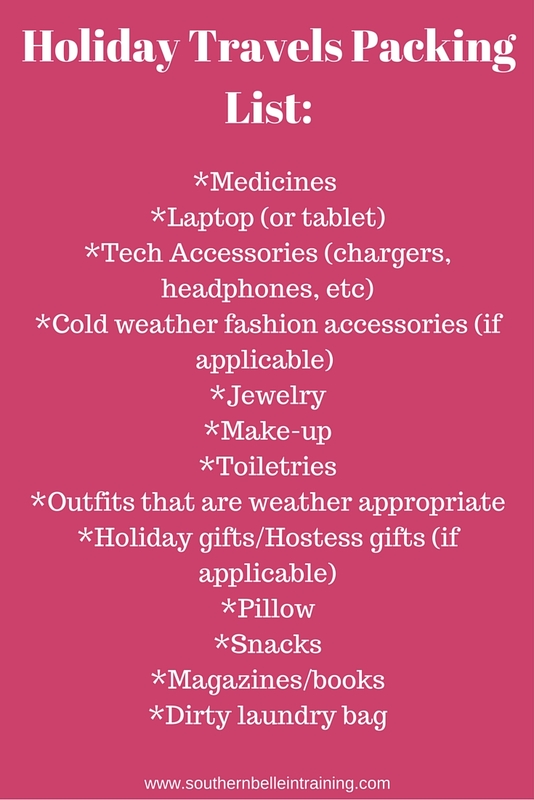 Below I'm sharing a little graphic which includes the rest of the items that I pack on my travels! 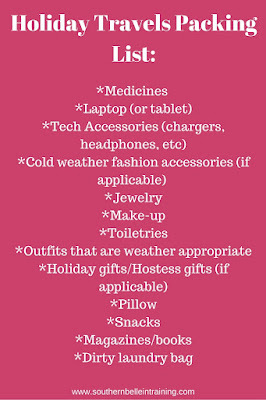 How many of these items do you bring with you on your holiday vacations? Is there an item that you always seem to forget when traveling? 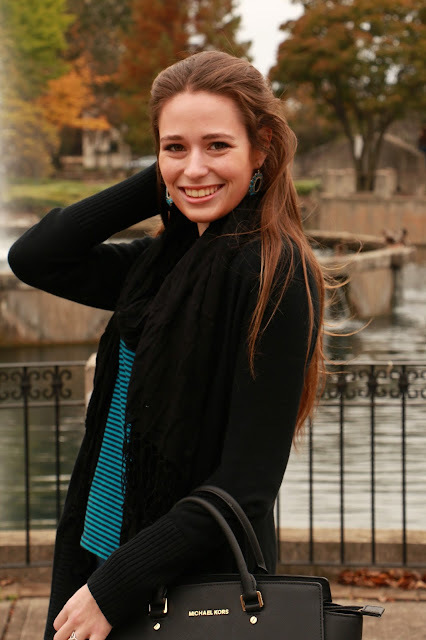 I'm so excited to be featuring my beautiful suitemate Caroline in today's blog post! 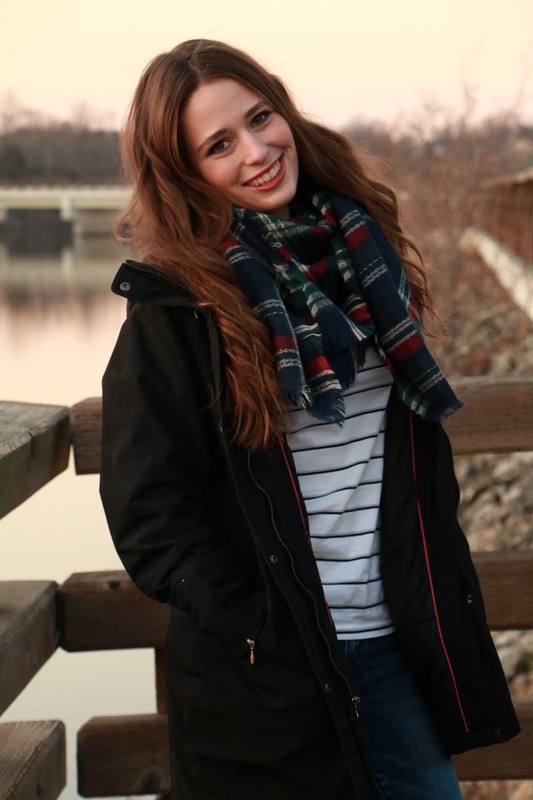 Her adorable outfits have been featured on the blog before. :-) Check out both of our takes on casual fall dresses! I am obsessed with this pretty blue and white dress from Romwe. The print is too pretty, and it's the perfect type of dress to wear at all times of the year! 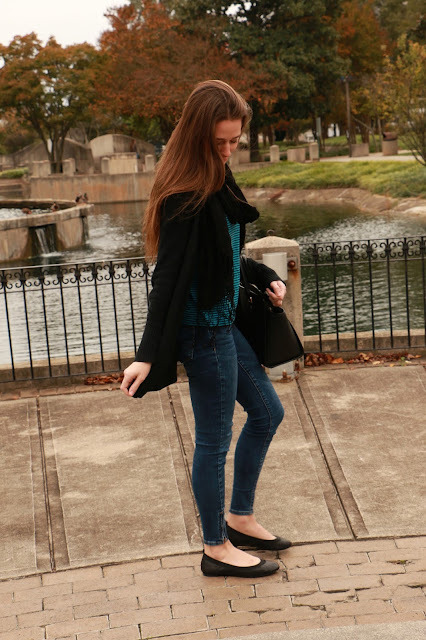 I would pair it with a cute pair of sandals in the warmer months, and now in fall I loved layering it with one of my favorite blazers and a pair of fringe booties. 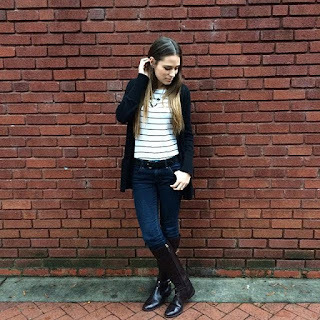 I think that this outfit would be the perfect fall date night look! 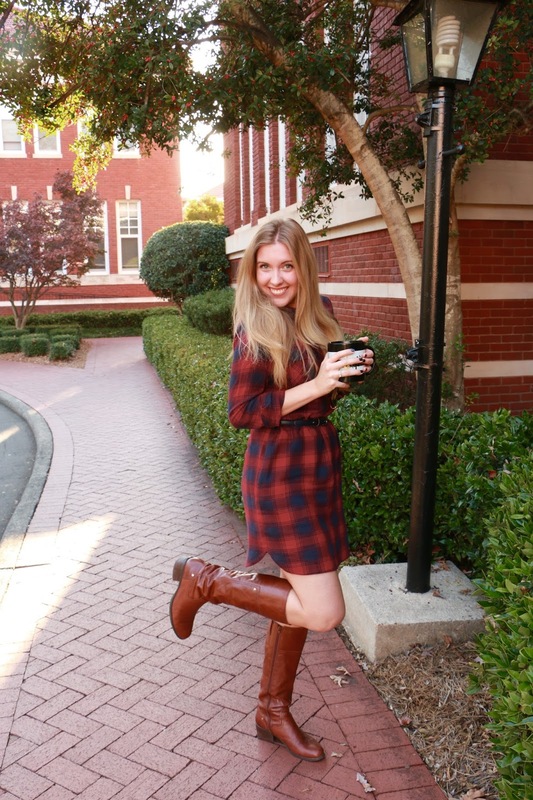 Caroline also looks wonderful in her plaid shirtdress! Caroline's style is a bit more laid-back then mine, but she always looks so put together and naturally gorgeous. The shirtdress that she is wearing would be a perfect option for Thanksgiving dinner, or any other upcoming holiday festivities! 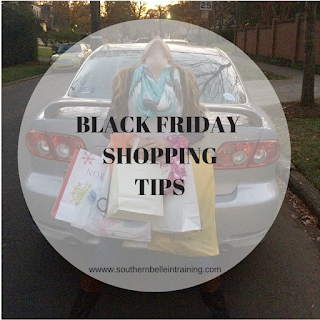 With so many years of "experience" behind me, I thought that I would share some of my best Black Friday tips for all of you. 1. Have a game plan. It's very important to organize some sort of a plan of attack before Black Friday happens. Early November is a good time to start doing this! Having a plan doesn't mean that you need to have an agenda so strict that it has a long list with the order of what stores you're going to at what times, or what part of the mall you're planning to park at. Part of the fun of Black Friday is the craziness, which means to expect the unexpected! But things that are smart to plan out are things like how much of a budget you're allowing yourself to spend on Black Friday, a couple stores that are "must-visits," making sure that you have any coupons or gift cards ready to go, and figuring out what time of day you want to leave for shopping at. Having the basics planned out will guarantee you less stress for certain when the big day rolls around! 2. Make a tentative shopping list. As I said above, the name of the game when it comes to Black Friday shopping is to expect the unexpected. What goes right along with this is making a shopping list, especially when it comes to big-ticket items like electronics. 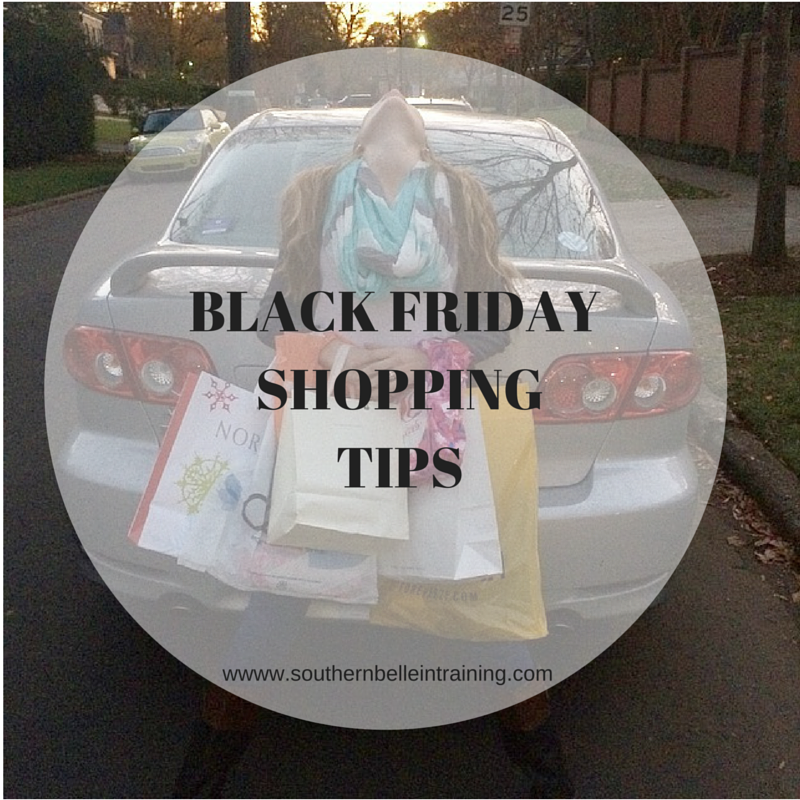 But since it's hard to predict crowds or shopping patterns each year for Black Friday, make sure that your shopping list is a tentative one (and be okay with that!). There have been many years when I've headed to the mall with a certain clothing item or accessory in mind, only to find that it's been sold out long before I got there. The good news is that usually I end up finding things that I liked even better than my wish-list items, or if not, there's always Cyber Monday! 3. Wear comfortable clothes. For a long day of shopping and walking, fashion isn't the name of the game. You're going to be out shopping for the hottest new fashions, but it doesn't mean that you need to be actually wearing them that day! I usually opt for an outfit that's semi-cute, but mostly comfortable, and easy to change in and out of in dressing rooms. Last year I wore an older and broken-in pair of riding boots, a t-shirt and cardigan, and jeans. 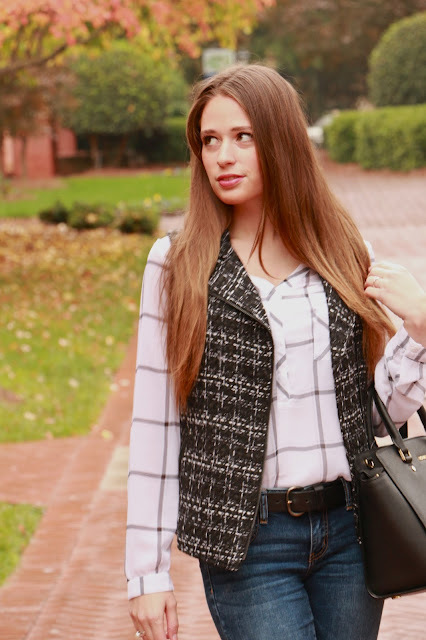 Put-together but still casual! 4. Take your best shopping buddies! Black Friday is way more fun with friends! My favorite years of Black Friday have been the years that I've spent it with some of my best shopping buddies on-hand. Plus- you have people you trust right there with you if you need a second opinion on a fashion purchase or for advice about a holiday gift for someone! 5. STICK to your budget. While your shopping list and game plan for the day might have to be tentative, something that should not be is your budget. Stick to this! It can be easy to get caught up in the fun and festivities of the day and to over-spend. That can set you over your budget in other areas of your life, as well as pull away from other people's holiday gifts that you may still need to buy. Take a look at your finances before you head to the mall, and know your limit! Each year, I try and spend as little as I can in the first few weeks of November so that I have more money to spend on Black Friday, since I know that I like to get a lot of things! Are you planning to go Black Friday shopping this year? Any big items that you're hoping to score? Christmas gift shopping is underway: I always like to buy my Christmas presents very much ahead of time. I'm not a last minute shopper when it comes to gifts! After my hair appointment, I stopped at Concord Mills, a huge indoor outlet mall outside of Charlotte, and started tackling my Christmas list. I found my dad's present and also gifts for a couple girlfriends. I find that spreading out buying presents helps me to keep a better budget, and definitely has me a lot less stressed when the holidays do arrive! I swiped....DELETE: I deleted my Tinder app this past week. Well... doesn't that feel interesting typing that out on my blog. ;-) Question: as I plan out blog content for December/January, would y'all be interested in me writing out a post detailing some of my experiences and thoughts with Tinder? I feel like this has become such a fascinating cultural phenomenon, and while my experiences weren't 100% negative, it definitely wasn't for me (at this time in my life). Life update: If you're friends with me on Facebook, then you know that I shared a big update about my personal life and future plans a few days ago! I'll be sharing on the blog soon! Still in my "attempting to save for Black Friday" mode... but utterly failing. I've been going out to eat (or actually going out! Haha) with friends a lot this month, and this definitely adds up. But my logic is that memories and good times (and good food!) spent with college friends during my senior year are always worth it. As I wrote above, Christmas gift shopping is also underway! I'm not going to share the purchases that I've made so far as I don't want to spoil gifts (in case any of the recipients read my blog ;-) )... but a few of the stores that I've shopped at so far for presents include here and here. Hope that y'all are having a wonderful week! It's currently initiation week for my chapter of ADPi, which we call Diamond Days, so every night I've been keeping busy with sorority events! I love this outfit because while it is casual, it's still put together. 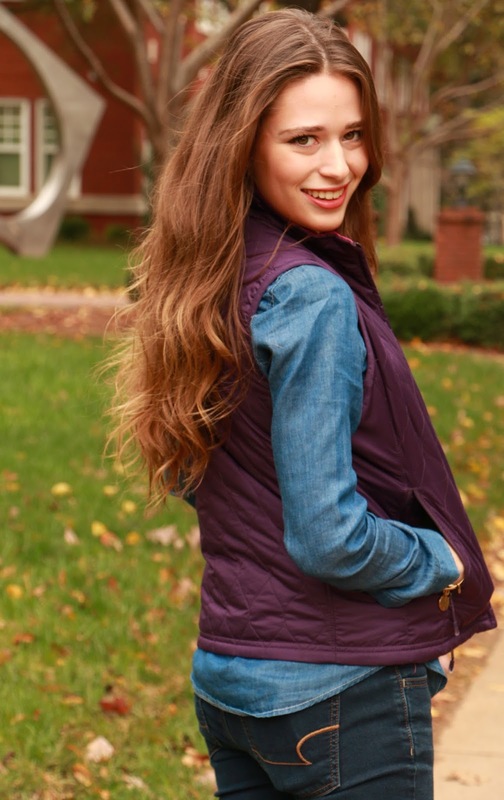 This was my first time layering my favorite chambray shirt over denim jeans (normally I pair my chambray with a skirt or black jeggings), but I ended up really digging the denim on denim look! If you're also going to double up your denim, I would recommend doing a lighter colored chambray shirt and darker jeans, just so your whole outfit doesn't look monochromatic! In other news, I'm getting my hair trimmed today! Since I started growing my hair out after a drastic haircut a couple of years ago, I've really been resisting getting trims. I'm embarrassed to admit that the last haircut/trim that I had was over a year ago! Needless to say, my split ends are all over the place. One reason that I go so long in between hair trims is because I have had yet to find a hairdresser here in NC! That is the one thing that I have loyally still done at home in Maine. The hairdresser that I'm going to today has come to me with glowing recommendations from a couple school friends though, so hopefully I will like the results- I'll keep y'all posted! Today's post is sponsored by Millennial Blogs and Teleflora. All opinions are honest and my own. 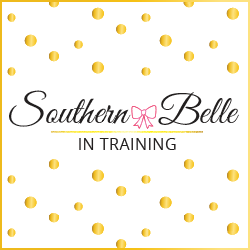 Thank-you for supporting the brands that support Southern Belle in Training! Thanksgiving and the holiday season is just around the corner, which means that many of us are soon gearing up for travels to spend time with family. For some people who live far from the ones they love, this time together only happens once a year during the holidays, so it's extra special! For those who are unable to make it home to loved ones on Thanksgiving due to work, school or travel, sometimes friends and co-workers can become like family, and that is how traditions like "Friendsiving" can start! Whatever your plans are, this is definitely a great season to celebrate those that you love. Whoever you're celebrating this Thanksgiving with, it is always a fantastic idea to bring over a host or a hostess gift. It takes a lot of work for someone to prepare and open their home, and showing a little appreciation can truly brighten someone's day! Teleflora has a beautiful collection of fall and Thanksgiving themed floral bouquets for this season that would make the perfect gifts for your family and friends this month! 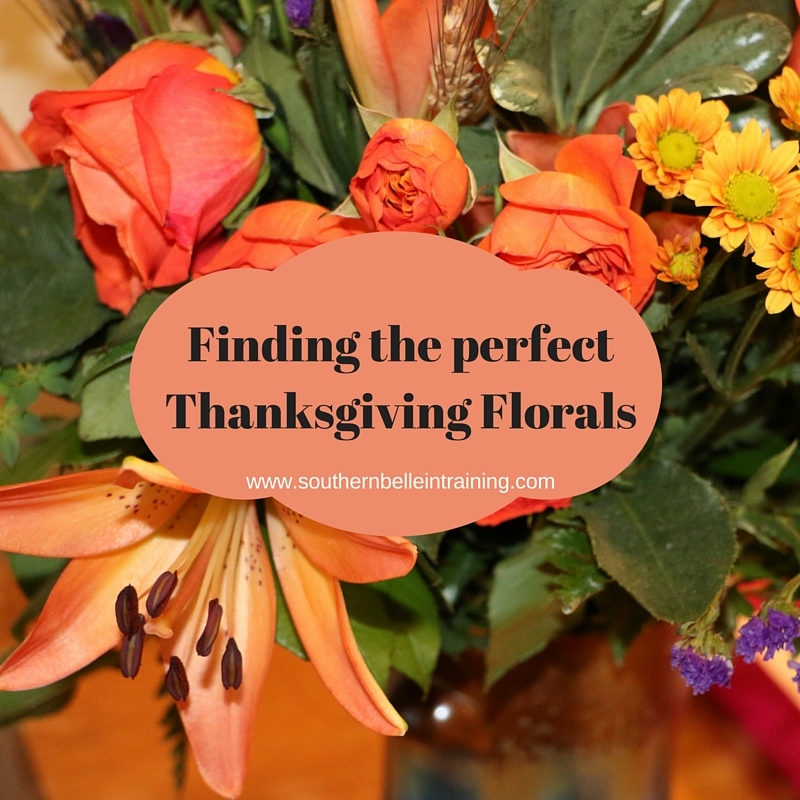 A few fantastic selections would be the Thanksgiving Garden Centerpiece, Maple Leaf Bouquet, Classic Cornucopia Centerpiece, or the Country Artisan Bouquet, which is the one that I selected for myself! 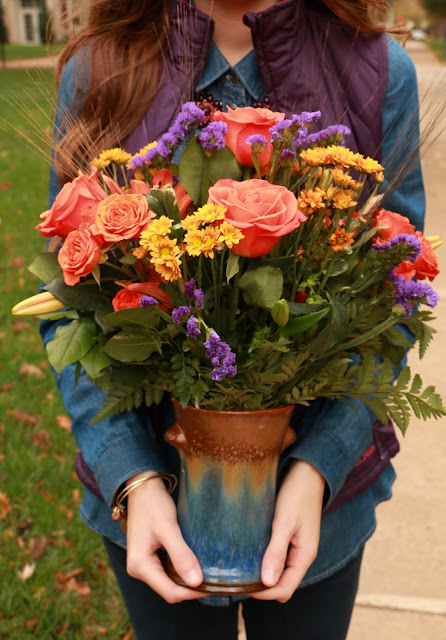 I think that any one of these would make a lovely host or hostess present for anyone who will be hosting you and/or your loved ones for Thanksgiving, but the beautiful colors in the Country Artisan Bouquet especially stuck out to me. Lilies and roses are some of my favorite flowers, and this bouquet was full of both types of these. 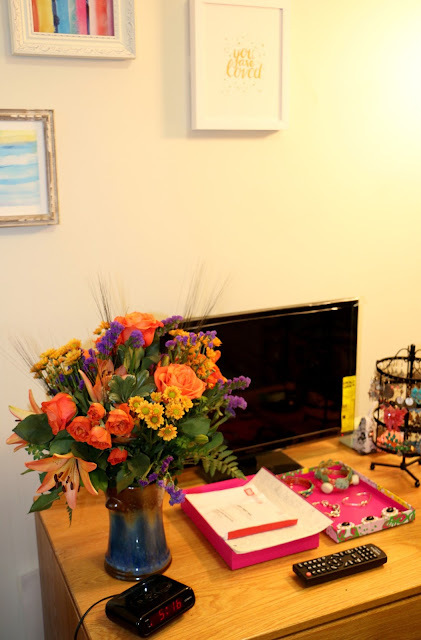 Check out how much these flowers brightened up my dorm room! 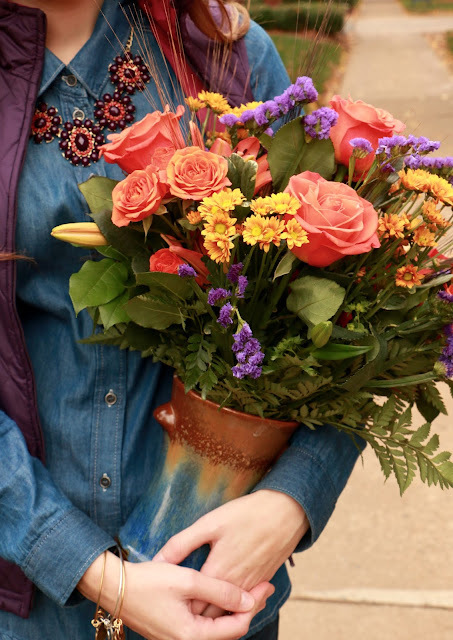 All of Teleflora's bouquets also come with stylish vases. The best part about the vase is that it lasts long after the flowers have died! I figured out a fun second use for the vase that my bouquet came in. 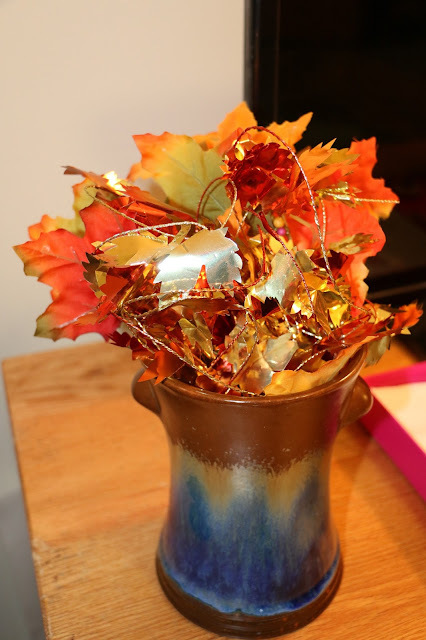 I decided to stick a couple of different fall garlands inside of it and let the tops pop out, to create a fun little fall themed room decoration! So simple to make, and it adds such a fun pop of all to my room! 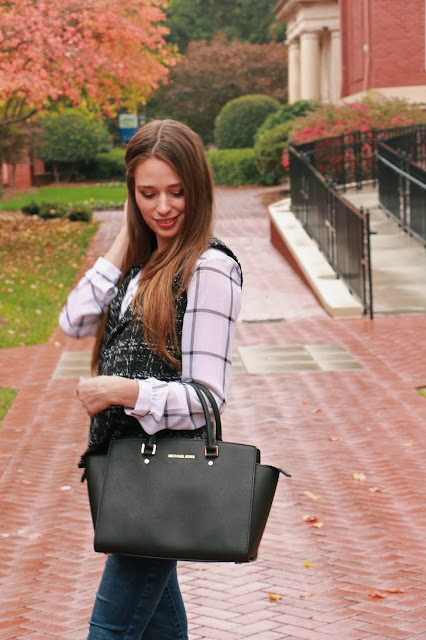 Stay tuned for a fall fashion post tomorrow! Dreary weather: Charlotte has been just full of rain this fall! I don't mind the occasionally rainy day, but all of these clouds and raindrops are starting to get me down a little bit! Back in September, it rained for a full two weeks in Charlotte, including right through my school's sorority recruitment and Bid Day! Lately the rain has been back in full force, except now with colder temperatures attached to it. At least my rain boots have been getting a lot of use! A fun weekend ahead: This past weekend, I was supposed to pay a visit to my former college to see my best friend (and help her with wedding planning!). That visit sadly had to be postponed since I had a nasty cough throughout the whole weekend! But this upcoming weekend, I have some fun plans to make up for all of the R&R. On Friday is my sorority's annual Mallard Ball, ADPi's very interesting take on fall semi-formal! And on Saturday night is my college's all-school semi-formal. These types of events are always a good time, and even more special since it's my senior year. Thanksgiving Break! It seems unreal to me that Thanksgiving break is just about two weeks away. Where is this semester going? I have really fun travel plans for Thanksgiving!! I'm headed north, but not going home to Maine. I can't wait to share more! I'm also starting to plan some outfits for my travels. One little purchase that I did make this week though was on this nail polish, to coordinate with my dress for my college's semi-formal this weekend! 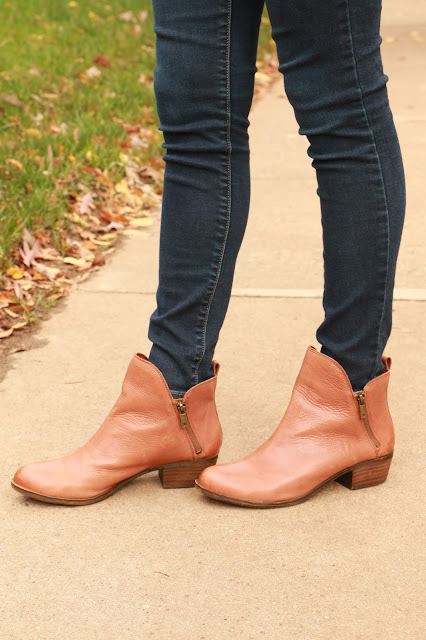 As I continue making a wish-list for Black Friday, I keep falling more and more in love with cute boots like these and these! Hope that the beginning of your week has gotten off to a great start! Be sure to check out yesterday's post if you haven't yet- it's unlike any post I've ever (co-)written before on Southern Belle in Training! What an exciting time to be a Charlottean! The Panthers, the NFL team for the Carolinas, is currently 8-0 for this year's season after their most recent win yesterday! I have never previously been a big football fan. I'm an only child, and neither my mom or my dad are into football. In New England where I'm from, you're either a diehard Patriots fan or you're not, there isn't really any between (and my family definitely falls on the "not" side- haha!). Of course, watching my first Panthers game meant that I had to dress the part! The Panthers' colors are blue and black, so I did what I could to show my team spirit. 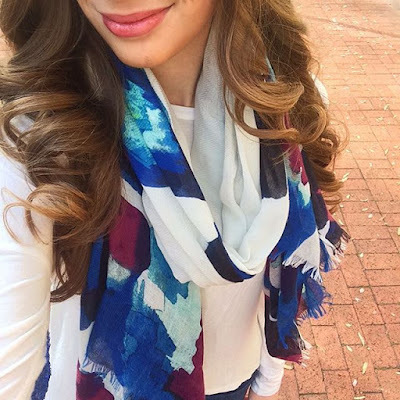 Yesterday was quite chilly in Charlotte, so I wore one of my favorite comfy Talbots cardigans over my shirt and scarf combo. One thing that I think makes dressing for game days extra fun is jewelry in your team's colors! The earrings that I'm wearing here are from Target, but you can find perfect game day jewelry at so many stores. Charming Charlie is always a favorite destination of mine for affordable and cute jewelry. 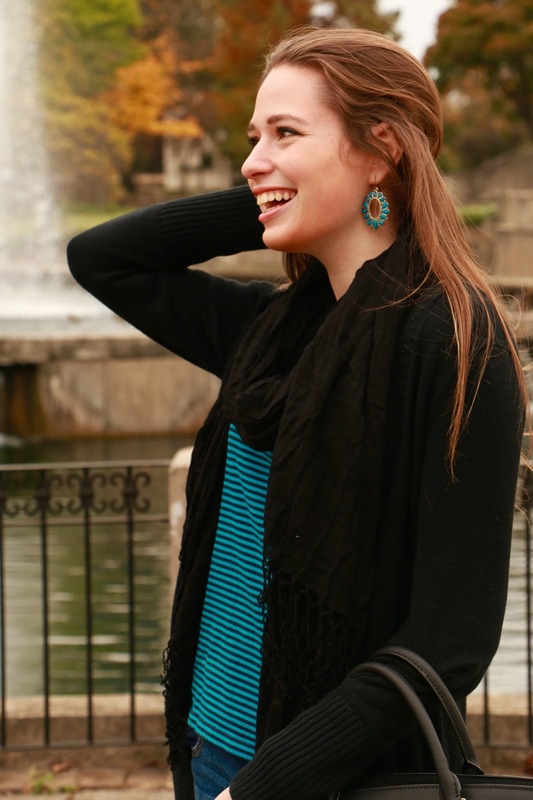 If you're very loyal to a team and see yourself attending many games or tailgates, I would invest in some nicer jewelry in your team's colors from Kendra Scott- her stuff is timeless! 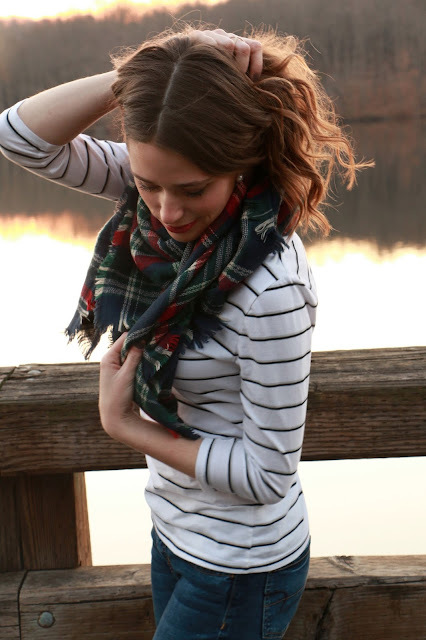 On a note unrelated to all things football- I am really excited about tomorrow's post here on the blog! 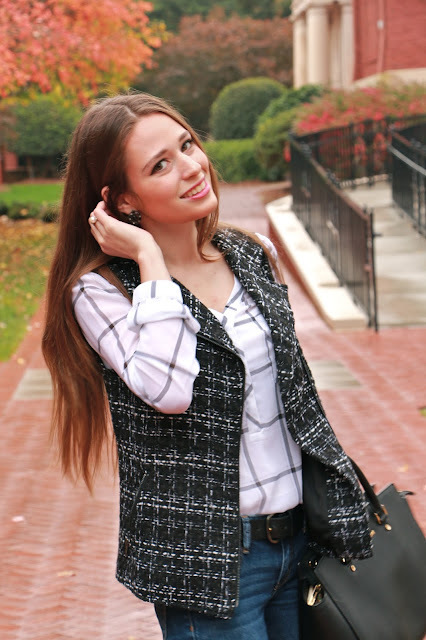 When brainstorming lifestyle content for this month on Southern Belle in Training, it hit me that I haven't written many posts about college life so far this semester. The post that I have scheduled for tomorrow is definitely a unique and personal one, but it's something that I can't wait to share!! The weather this past week in Charlotte has been a bit on the dreary side. We've had several days of rainy weather, all back to back. Sometimes I like to try and make my outfits extra bright and cheery when weather like this hits, but this week my fashion choices seemed to embraced the clouds and I wore almost all neutral outfits! I ended up absolutely loving this outfit that I wore earlier in the week. 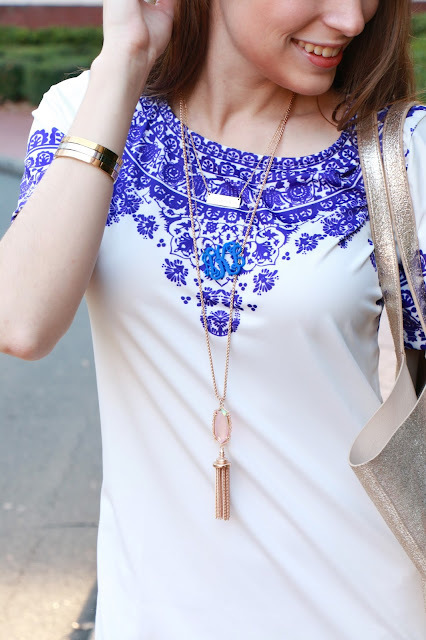 My top is from Target, and it looks wonderful both on its own, or paired with jewelry or a vest, like I styled it here! I don't try pattern mixing very often, but since the color scheme was the same on both the vest and shirt, it ended up working perfectly. This top is still available on Target.com, and comes in two other cute patterns as well! My first college Halloween = SUCCESS! I had the most amazing, crazy, hilarious, and spontaneous Halloween weekend! As I shared last week, this past weekend was my first time in college celebrating Halloween. I might have waited until senior year to celebrate, but "go big or go home" was definitely the name of the game! My bestie Mia and I went as the dancing girl twin emojis on actual Halloween, pictured above, and check out this blog post to see what I went as on Friday! Great new music. There seem to be so many great new songs popping up on the radio lately! I am 150% obsessed with Ariana Grande's new song, Focus. It reminds me a lot of some of her earlier music, but I think it's one of my favorite songs of hers to date! I am also really digging Justin Bieber's newest song, Sorry. I'm not a very big fan of Justin Bieber as a person, but I've really enjoyed a lot of music on his last couple of albums. I don't generally do a lot of shopping during the earlier part of November... my favorite holiday falls at the end of the month (favorite holiday being Black Friday! ), so I try and make the weeks leading up to it being weeks that I save as much as I can. Every year I try and go bigger for Black Friday then I did the year before, so this year I'll be saving as much as I can this month. 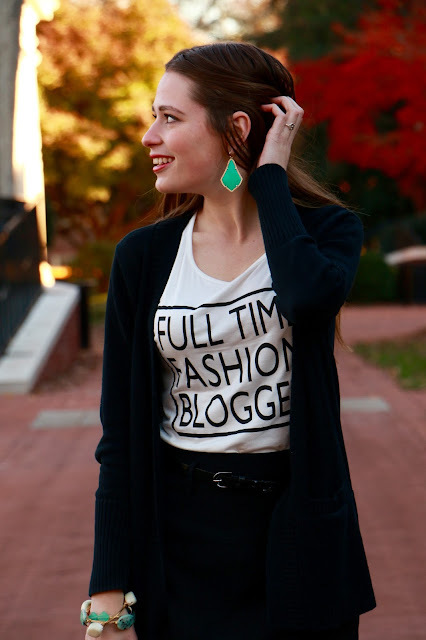 One thing that I did get last week though were these gorgeous earrings as a gift for co-hosting a blogging event at Charlotte's Kendra Scott store! A couple items that I'm hoping to score over Black Friday this year would be boots similar to these, or a beautiful new coat that would look something like this. Sorry that this post is up a little later than usual today! 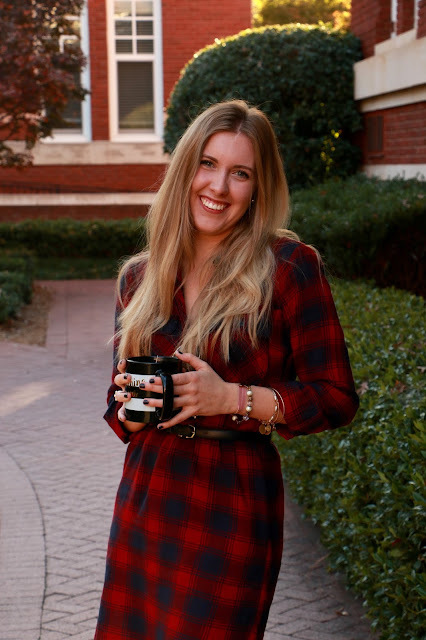 I stayed up late last night working on an essay for one of my communications classes and I had a serious case of writer's block with it, which meant no time to blog! Hope that y'all are having a great week! 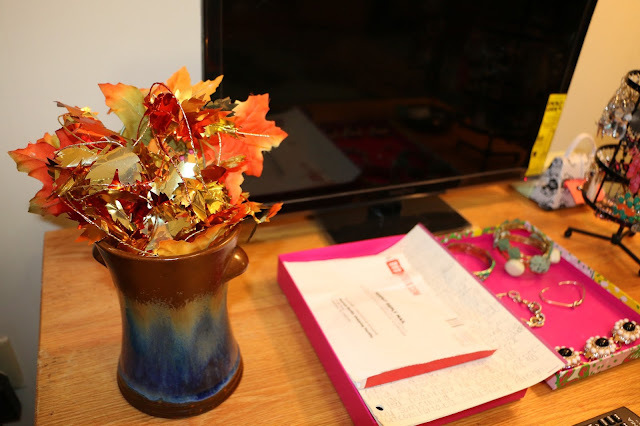 Fall 2015 Blogging Events Recap.